William Bayliss, the founder of the firm, was born in 1803 into a Shropshire family who moved to Priestfield, where he was born. His father Moses came from Benthall Edge, his mother came from Horsehay. He worked for Samuel Ferriday who owned coal mines and an ironworks at Priestfield. Moses was a blacksmith who had his own blacksmith's shop and looked after the mine pumping engines. Much of his work was for the miners, sharpening their picks, shoeing their horses and repairing hand tools. William was the third of eleven children. He disliked school and left as soon as possible. Before his tenth birthday he was working seven days a week in one of Samuel Ferriday's mine pumping engines. Although an easy job, he was left much to his own devices, and rarely saw anyone else. He particularly disliked working at night when he had to walk in the dark, to or from the engine. When William was around eleven years of age his father moved his business to Monmore Green to look after Mr. Ferriday's engines there, and William worked on one of the pumping engines on the site. When he was about fifteen years old he began working on a winding engine, which meant that he didn't have to work on Sundays. His father wanted him to improve himself and so found him a job as a blacksmith. Work was much harder in the blacksmith's shop, but it was not so lonely, and much more enjoyable. Around this time he became a devout Christian which would soon dominate his life. William gradually took over his father's business. He was an efficient lad and when he started keeping records and introduced "pay on the nail", it excused his dad the Saturday journey around the public houses trying to get his mining customers to pay their bills. This photo, which was taken at the churchyard at Empingham, Rutland, was kindly sent by Alan Murray-Rust. 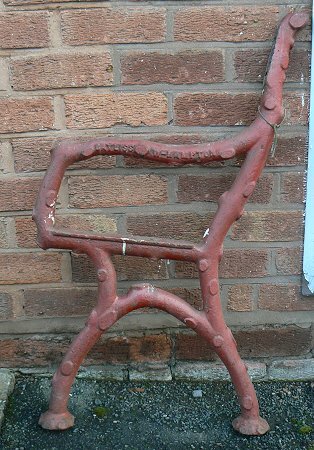 Could this be an early example of William Bayliss's work? If anyone can confirm this, please send me an email. In 1825, at the age of twenty one, William married one of his Sunday school teachers. She was a regular member of the Wesleyan Chapel in John Street, Ettingshall, where he was class leader of the weekly prayer meetings. They moved into a house in George Street, Ettingshall and over a period of around twenty five years had 14 children, but ten of them died young. The survivors were two daughters, and two sons, William and Samuel, who later joined the firm. A few months later his father suddenly died. William took over the business, but as well as his work in the blacksmith's shop, he had to carry out repairs on the mine pumping engines. It was extremely dangerous work. Many people were killed or injured in mine shafts as a result of brick or rock falls. They were dry-bricked, or un-bricked where there was rock or coal. The shafts were deep with three rod-operated pumps. The lowest pumped water into a cistern, the second pumped water from the cistern into a second cistern, and the third pumped the water to the surface. 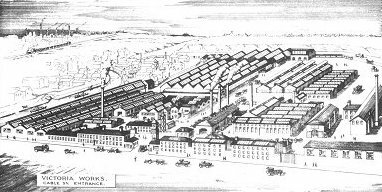 William saved hard and bought a large plot of wasteland in Cable Street, Wolverhampton where he established the Victoria Works in 1826. He began to produce iron products including sheep hurdles, railings, gates, stable fittings, ornamental ironwork and chains for mining and shipping. Sadly William's first wife died young. She discovered a lump in one her breasts, and had a mastectomy. Although successful, other cancerous growths appeared in her lungs. A little while after her death he married again. His second wife had previously married and had a daughter from her first marriage. William entered into a business partnership, but was having health problems caused by the smoke and sulphurous fumes that were often in the air at Ettingshall. Because of his chest complaint he was unable to cope at work, and felt that his partners were taking advantage of him. After a disagreement in 1853 the partnership was dissolved. Eventually his brother Moses, who had been a nut and bolt maker at Providence Works, Darlaston, joined him in the venture. The two firms were amalgamated as W. & M. Bayliss of Victoria Works, Monmoor Green and Providence Works, Darlaston, with a London office at 43 Fish Street Hill, Eastcheap. 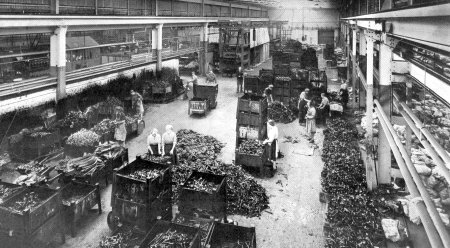 In 1859 they were joined by Edwin Jones, an iron trader from South Wales who had previously married William's daughter, Jane. The partnership then became Bayliss, Jones and Bayliss. 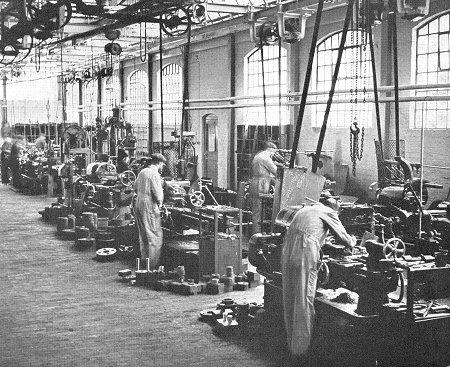 The new machine shop in 1949. Traditional methods still in use in 1953. The company were very successful and Mr Jones became resident in London, running an office at 84 Cannon Street E.C. It seems that Moses went to America to introduce the rolling of corrugated sheet iron, but this can't be verified. However, Moses was the father of Wolverhampton born Sir William Maddock Bayliss, who later became a distinguished physiologist. In 1902, at University College London, with E.H. Starling, he discovered the hormone secretin and established the role of hormones. Secretin is used today as an intervention for autism. Sir William was also a non-executive director of Bayliss, Jones & Bayliss. In 1873 a Wolverhampton Trade Directory lists William, the founding member of the firm, as living in Oaks Crescent. William moved there to get away from the smoke and fumes in Monmore Green. He had been advised to “move to the fresher atmosphere of Wolverhampton”. Oaks Crescent was on the edge of a rural district. His journal expresses his pleasure at the blossoming trees, the clean air and the singing of the birds in the garden of his new home. A few years later, his doctors advised him to retire to the south. The family initially moved to Clifton, but because of the smoke and fog there they moved again to Torquay, where William lived until his death in 1878. One of the company's large machines. View the fine example of Bayliss, Jones & Bayliss fencing and gates that are in Grangewood Park, South Norwood, London. 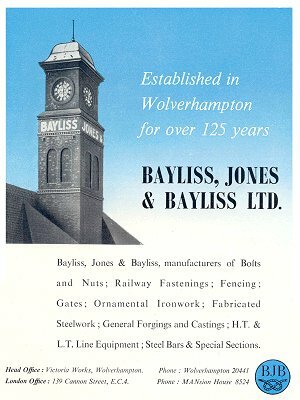 Messrs. Bayliss, Jones and Bayliss of Wolverhampton, and King William Street, EC, have recently brought out an improvement in iron hurdles, gates, etc. which consists of securely fastening the ends of the horizontal bars to the uprights without riveting. It is shown by the annexed engravings. A shows the horizontal bar threaded through the upright, ready for clenching; and drawing B the horizontal bar after it has been clenched to the upright, from which it is impossible to move without cutting the horizontal and upright to pieces. Hurdles made upon this principle are found to be very strong and rigid. The mode of manufacture moreover, demands the employment of first-class iron, as none other will stand the test of clenching the ends at the short bend. The hurdles will consequently bear the rough usage to which they are very often necessarily exposed. An article from The Engineer. 30th October, 1885. The lock nut illustrated in the accompanying engravings is now being brought out by the patentees and manufacturers, Messrs. Bayliss, Jones, and Bayliss, of Wolverhampton and Cannon Street. A simple and effective locking arrangement for such work as fishing rails is a great desideratum. Many forms have been brought out, but none so simple as the Eureka, which is made in the ordinary way, with the exception that on the outside surface of it, a small pyramidical prominence is left, as seen in Fig. 1. After screwing the nut, this prominence is compressed and the outside surface made level, but in the act of compressing it, three threads of the nut are deformed where the prominence has been pressed into the nut, as shown in Fig. 2. The nut will run easily on the male screw or bolt until the deformed or irregular threads are reached in the nut, when the spanner is necessary, and with its aid the nut, while passing along the bolt, deforms the thread, as seen in Fig. 3. so that at the point where the operation of screwing terminates, the threads of the bolt accommodate their shape to the deviation in the three threads of the nut in such a way that it is impossible for the bolt or nut to be moved either way without the aid of a spanner and considerable force. 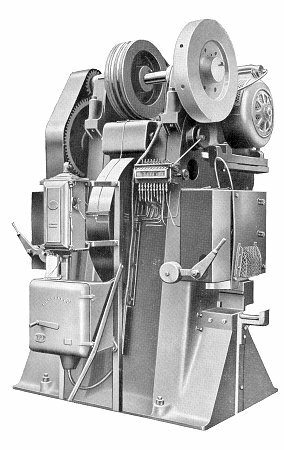 The makers have had these nuts on a large and powerful multiple press for nine months without requiring to be touched, whereas previously they had used other lock nuts, which, owing to the continual vibration of the machine, needed constant supervision and daily tightening. They claim several advantages as possessed by this nut, including simplicity, security, cheapness, that it will not move even if the bolt becomes elongated in work, and that it can be used several times. They make them in iron and in steel, but they specially commend mild steel bolts and nuts. 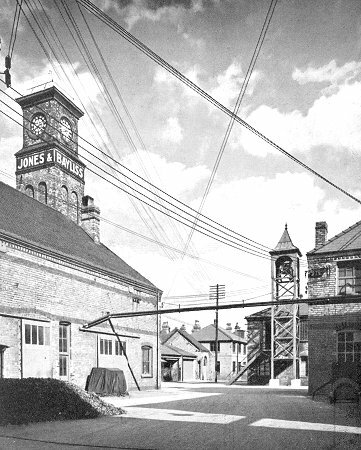 Victoria Works yard and the old clock tower. Cable Street. From the 1928 catalogue. By this time the company produced large numbers of rails, fish plates, chair spikes, fastenings and nuts, for the railways, and nuts & bolts, and all kinds of iron work, from massive cables and anchors to half-inch chains and small screws. His son William, a quiet and retiring sort of man, who was at home in the office, lived at The Firs, Merridale Road. Samuel, his brother, was more active and worked in the pattern shop of the foundry. William would later become chairman and be succeeded by Samuel in 1925. Victoria Works. From the 1928 catalogue. Monmoor Rolling Mills. From the 1928 catalogue. 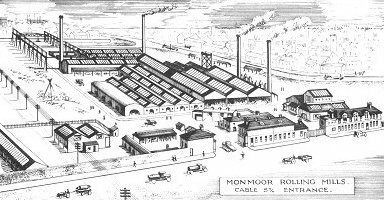 In 1896 the company purchased the Monmoor Ironworks on the other side of Cable Street, which included rolling mills and puddling furnaces. The iron works were founded by Mr. E.T. Wright and Mr. David North to produce high quality iron plates and sheets using the 'Monmoor Works' brand name. From the late 1850s they were managed by George Adams, who founded the Mars Iron Works. An advert from the GWR Magazine, July 1932. The company produced a wide range of products for use in the garden, in sports grounds, and on the farm, as can be seen from the advert opposite. 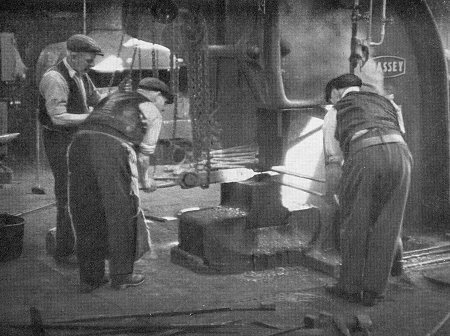 A bench-end that was cast in the company's foundry. A close-up view of the maker's name on the bench-end. Courtesy of Brian Shaw. By the early 1870s Mr. David North retired after accumulating a large fortune, and E. T. Wright continued to run the business alone. 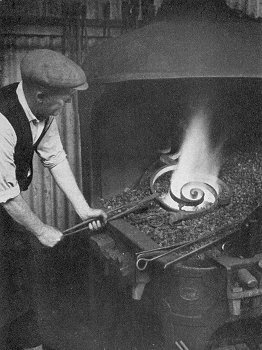 It is believed that George Adams still continued to manage the works as well as running his own nearby iron works. In 1901 the company was floated on the Stock Exchange, but in the early 1920s sales fell and problems followed. Sales to the railway companies were the worst affected, although the fencing side of the business suffered as well. 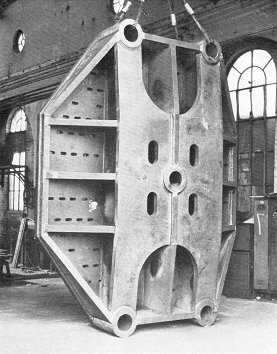 A typical large fabrication made at the works. 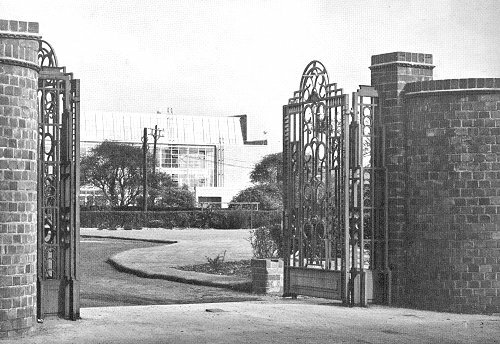 Gates made at the works for the Territorial Association Headquarters in Wolverhampton. The G.K.N. company history reports the rumour that "William Bayliss, the then chairman and son of the founder, had diverted capital from the business into a country estate and had speculated unsuccessfully on the Birmingham Stock Exchange, drawing the company in to debt". Around 1922 Thomas Swift Peacock, representing the G.K.N. Group of Companies, negotiated the purchase of Bayliss, Jones and Bayliss. 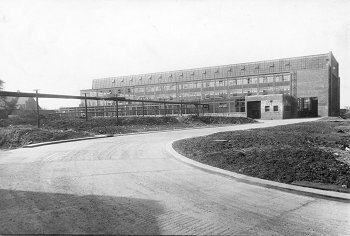 Peacock was in charge of the group’s Atlas Works in Darlaston. The G.K.N. Board had given him full control of the nut and bolt and railway fastening departments of the Midlands. Though a subsidiary of G.K.N. from 1922, the company kept its own name and the Bayliss family continued to provide its management. It is generally understood that Mr. Jones, who was still in control of the London offices, forced the issue by declaring his willingness to sell his portion of shares to G.K.N. Mr Jones' son Edwin, his son-in-law, Sir Murray Hyslop and finally his grandson Roy Hyslop, followed him in managing the London office and showrooms, which had expanded to 139-141 Cannon Street by 1938. 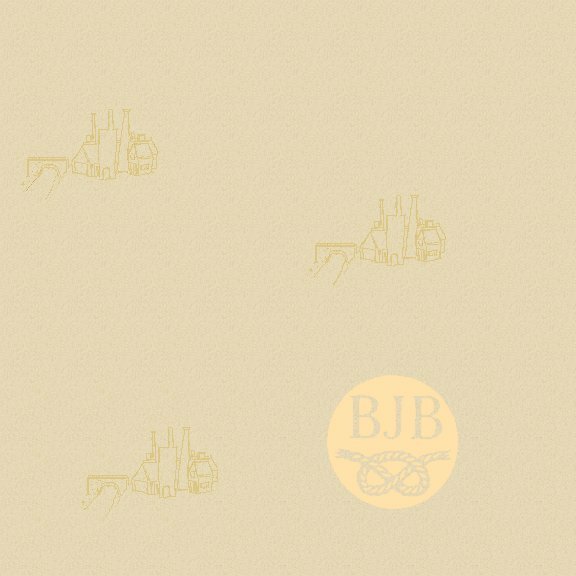 A special purpose BJB swaging machine. A 13ft. by 10ft. 6ins. 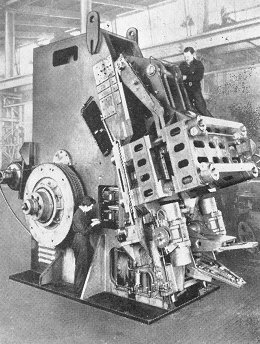 press head constructed at the works in the late 1950s. 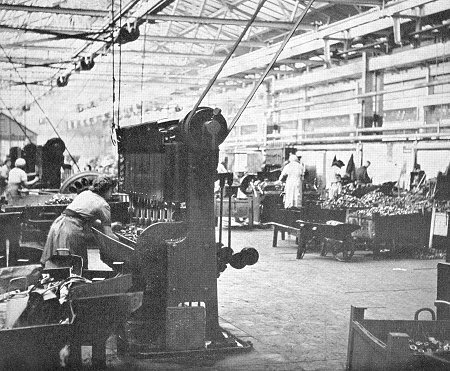 Under Thomas Peacock, in 1927 and 1928, a new screw rolling shop opened, the bolt works were reorganised to make production more efficient and a new mill for the conversion of billet into bar, opened at Monmoor Works. The company seems to have concentrated more on the fencing, railing and general ornamental ironwork side. In the great slump of 1929-30 they were hit hard but recovered strongly from the mid 1930s, which were the company’s most successful years. Samuel Bayliss died in 1932. His sons, P.S. and F.W. 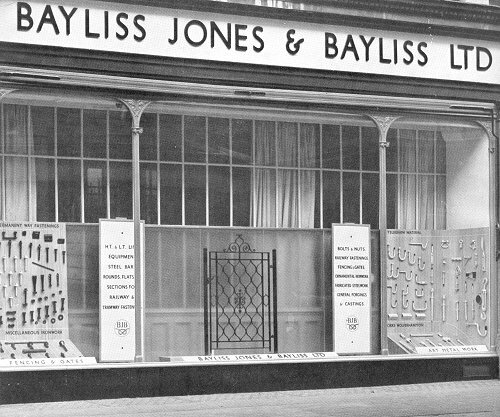 Bayliss, joined the board in 1921 and 1925 respectively, and they became the joint managing directors in 1928. 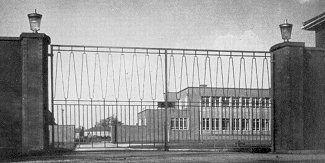 The company continued to produce high quality ornamental ironwork such as gates, fences, balustrading, railings, and tree guards, and became well known for its products. A large proportion of the work at this time was for county councils, carrying out their 'improvements' of substituting railings for hedges. Demand for balustrading to span the many new bridges extending over Britain's motorways also kept the firm busy. 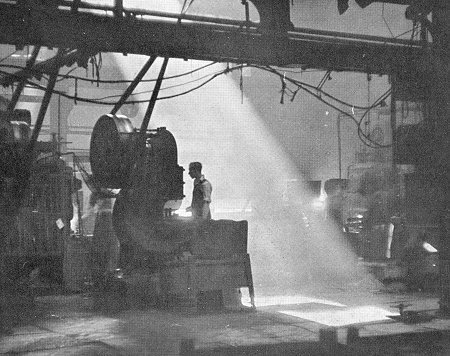 The Forging Shop built in the late 1950s. 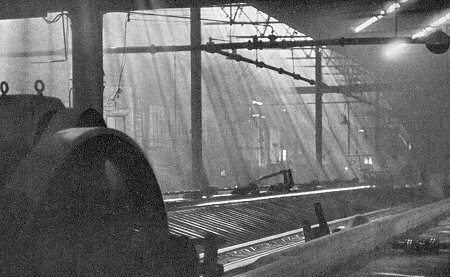 The products which the 1953 Wolverhampton Official Handbook mentions include: plain and ornamental wrought iron fencing; for railways - black bolts and nuts, screw spikes, chair bolts, fishbolts and other fastenings; equipment for overhead telegraph and telephone lines; fabricated steelwork; general forgings; agricultural equipment - tractor toolbars, heavy tractor cultivators, plough beams and brackets, hay rake frames, etc. ; and a recently created department for the welded steel fabrication of machinery frames, bed-plates, mill plant, constructional steelwork, agricultural implements, containers, stillages, hoppers and guards. 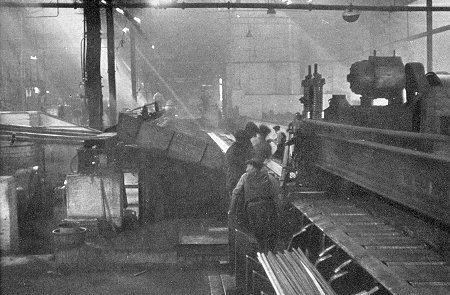 The company's steel rolling mills, with a capacity of 1,000 tons per week, were kept busy, as orders for miles of railings at a time were not uncommon. The amount of metal being used in the works must have been enormous. 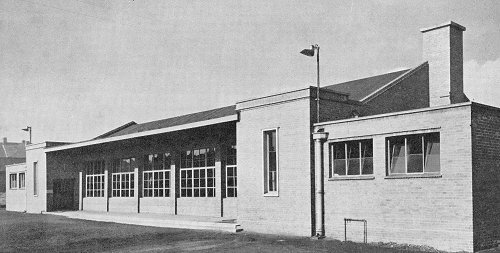 The modern galvanising shop had a capacity of 350 tons per week and was not only used for the company's own products, but also did outside work. The London office and showroom at 139 Cannon Street. 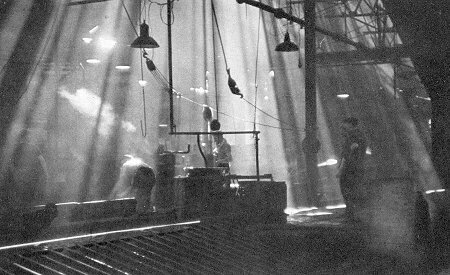 By the mid 1950s the company employed around 1,500 people, many of whom had completed 30, 40, 50, or even 60 years service at the works. There were tennis courts, a bowling green, a netball court, a sports ground, football and hockey pitches, a cricket ground, and a children's playground, complete with swings, roundabouts, and a paddling pool. 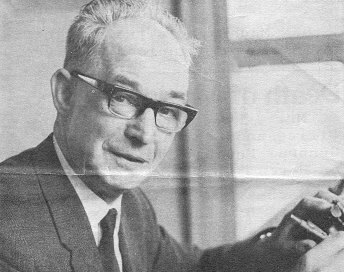 The Managing Director at the time was Mr. Roy M. Hyslop, the great grandson of Mr. Jones, one of the company's founders. 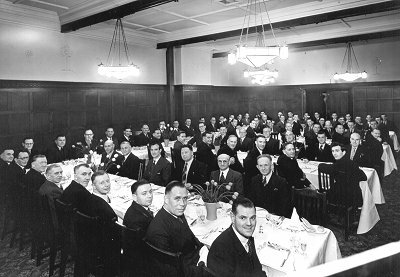 A company dinner at the Victoria Hotel, in November 1952. 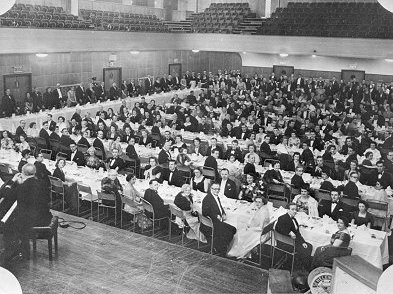 Employees were out in force at the Civic Hall, to celebrate a colleague's wedding. 27th March, 1952. Courtesy of Nina McCarthy. 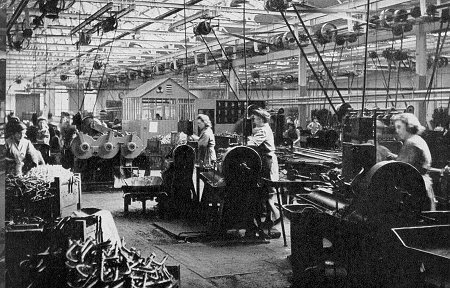 At this time the company had a wide variety of customers, including local authorities, architects, power stations, the Admiralty, the war Office, the Ministry of Works, the Air Ministry, and private companies. The company produced rail fastenings for British Rail and designed various types of fasteners, mostly resilient fastenings for long welded rails. 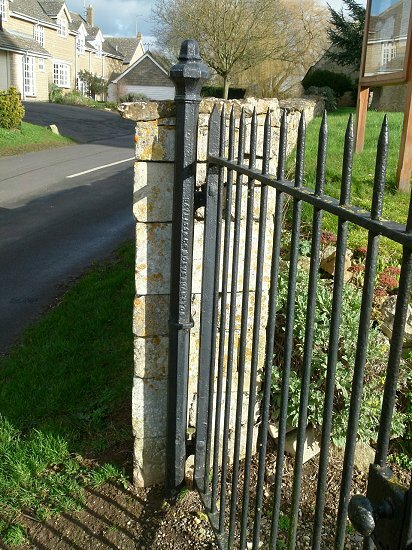 In addition to their standard lines of railings and gates, they also made one-off pieces to the designs of the individual customer, or very often, his or her architect. 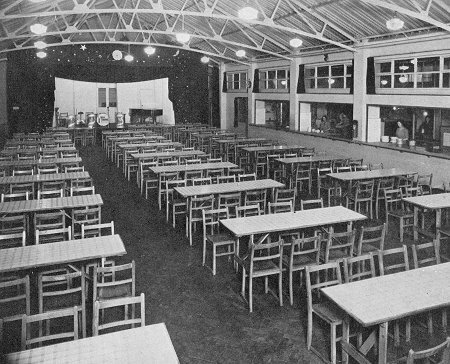 The canteen could provide hot meals for up to 400 people. It had a polished wood block floor to enable the dining area to be quickly converted into a dance floor for evening events. The dining room. 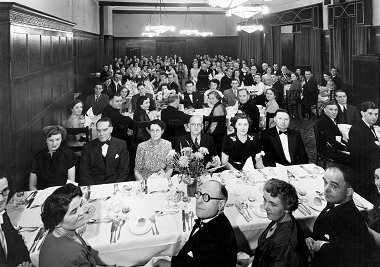 The dining room had a fully equipped stage so that all kinds of events could be held there. The serving hatches can be seen along the right-hand wall. A corner of the large kitchen. Part of the Test House for tensile, Brinell, and Izod tests. 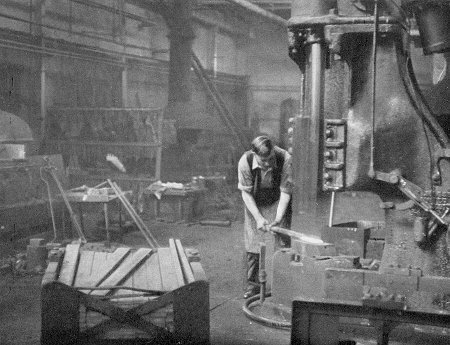 Part of the tool room that supplied precision tools and forging dies. A corner of the Screw Shop where nuts and bolts were finished after forging. Part of the Bolt and Screw Spike Forging Shop. 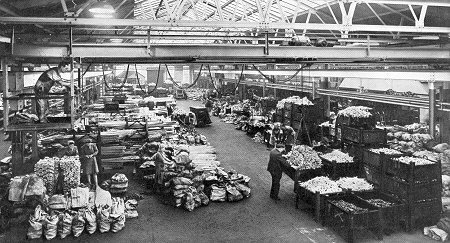 The Inspection, Packing and Despatching Warehouse from where goods were sent by road, rail and canal. Another view of the Inspection, Packing and Despatching Warehouse. The Production Machine Shop for the company's electrical overhead transmission line equipment. A horizontal forging machine producing parts for the electrical overhead transmission line equipment. Working on one of the Massey Hammers in the Smithy. Another of the Massey Hammers in the Smithy. The new Machine Shop at night. 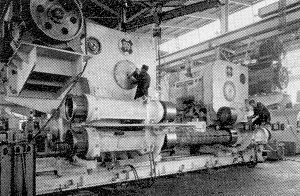 The gravity, semi-mechanical cooling bed for the rolling mill. 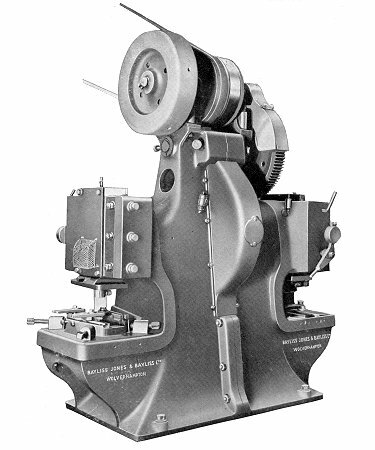 The cutting machine that could cut twelve ⅞ inch diameter bars in one operation. A presentation in the works. Courtesy of Nina McCarthy. 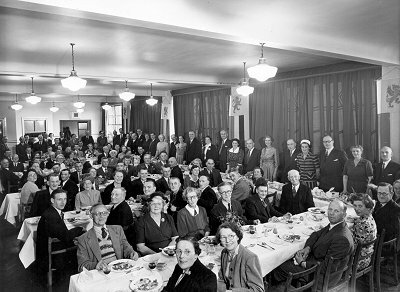 Long service awards, July 1953. Courtesy of Nina McCarthy. 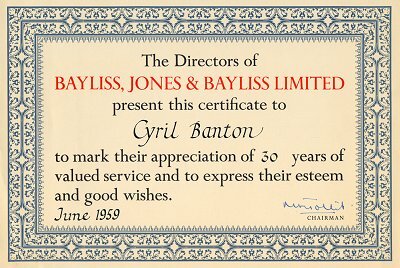 Cyril Banton's long service award. Courtesy of his daughter, Nina McCarthy. The 1,450 skilled workforce became engaged in the design, development and manufacture of a wide range of new engineering products. Many of the company's traditional products were still produced, such as fencing and heavy machinery, and the new company was divided into four divisions. 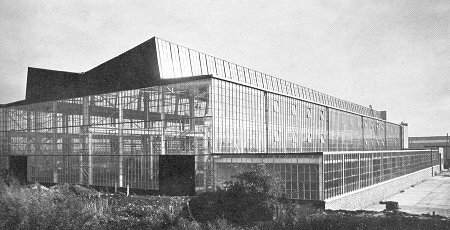 The Metal Forming Plant building on the Monmoor Works site. Courtesy of Nina McCarthy. The Metal Forming Plant Division (MFP) manufactured rolling mills and ancillary equipment under licence from Moeller & Neumann, G.M.B.H. West Germany. Products included steelworks plant, billet inspection machinery, special purpose machine tools, steel fabrications up to 100 tons, and general engineering projects. The entrance to the canteen and grounds with the new machine shop in the background. A map showing the layout of GKN Machinery Limited. The Peco Division produced Peco injection moulding machines for thermoplastic, thermosets, and rubber compounds, extrusion machinery for thermoplastics, and spark erosion machines for cutting dies and press tools. 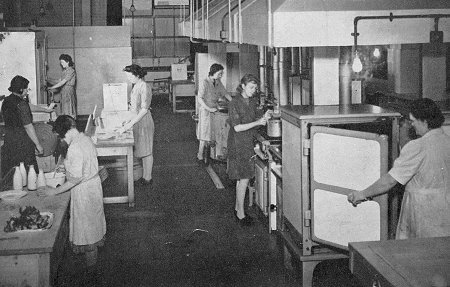 A machine demonstration area was built at Cable Street along with a comprehensively equipped machine development department, where complete plastics production facilities could be designed and then manufactured for customers anywhere in the world. A Peco 25 MR injection moulding machine. A GKN 'Unimate' industrial robot. 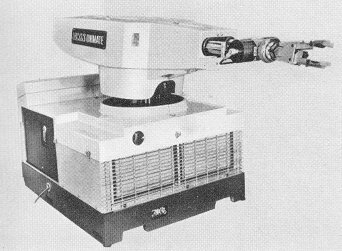 The Unimation Division produced GKN 'Unimate' universal automation equipment, and programme control systems for capstan lathes and automation. The Components Division produced Bayliss, Jones & Bayliss motorway and bridge parapet railing, fencing and gates, and mining support equipment. 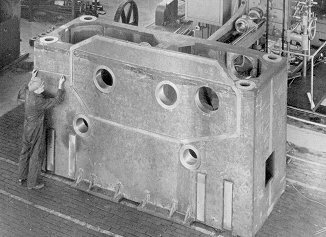 Early contracts for GKN Machinery included a 235 ton double-side trimming shear, capable of trimming plates from ¼ inch to 1½ inch thickness, and the world's most advanced heavy plate mill, the biggest of its kind in the country. It could deliver up to 8,000 tons of standard quality steel plate per week. A double side-trimming shear under construction. A Bayliss, Jones & Bayliss double ended press. 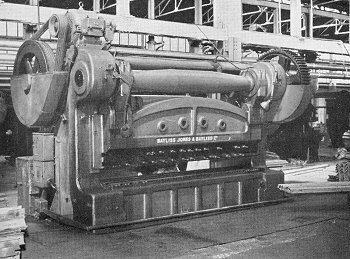 A Bayliss, Jones & Bayliss multiple punching and shearing machine. A Bayliss, Jones & Bayliss bar cropping machine. 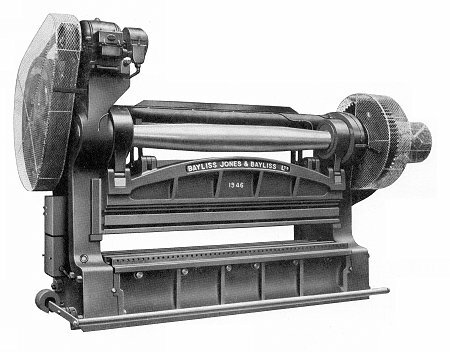 A Bayliss, Jones & Bayliss rolling and straightening machine. 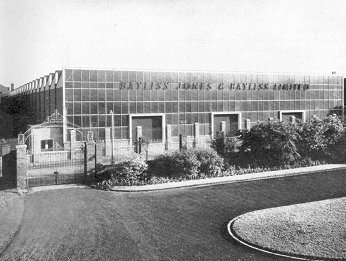 A Bayliss, Jones & Bayliss horizontal bending and forming machine. 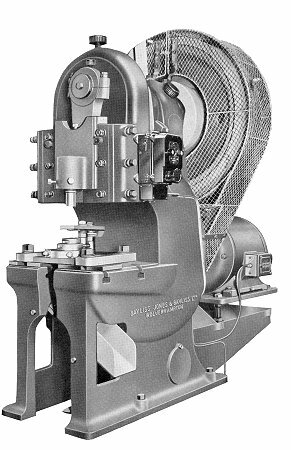 A Bayliss, Jones & Bayliss single end press. 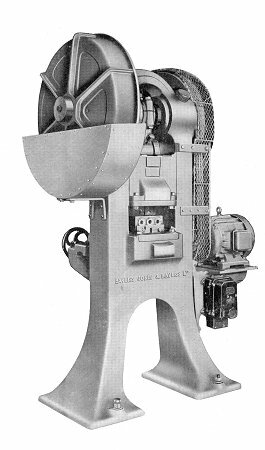 A Bayliss, Jones & Bayliss billet and bar cropping machine. 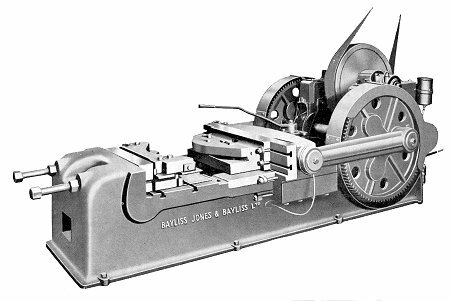 A Bayliss, Jones & Bayliss roll turning lathe. Machining a 36ft. long, 40 ton casting in the Heavy Engineering Department. Under a £1m. improvement scheme a completely new assembly bay, 75ft. 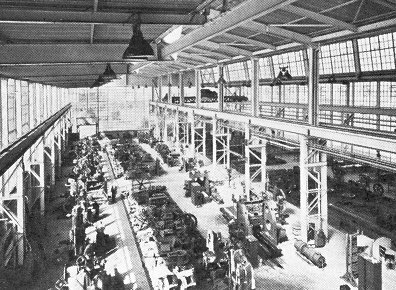 wide was constructed on one side of the main workshop. It had several cranes installed to handle loads of up to 100 tons, with a maximum lifting height of 45ft. 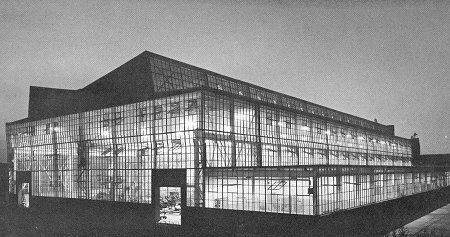 The main workshop was also extended to a length of 425ft.to increase the internal area to 65,000 square ft. 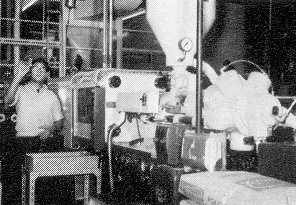 Many large new machine tools were installed, some featuring a digital readout, which was new technology in the late 1960s. 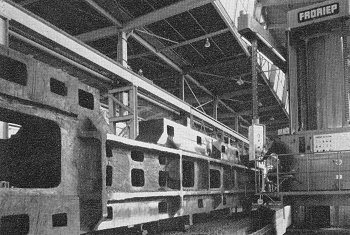 The heavy fabrication department had facilities for submerged arc and CO2 automatic and semi-automatic welding. Other facilities included profile and straight line cutting up to any size of plate, and plate thicknesses up to 2ft. The product range also included power presses, inspection equipment for steel billets and slabs, welded chassis and body assembly for fork lift trucks, tool drawer bars, linkages for tractors and the 'Birfeed' range of automatic bar feeding and loading magazines. 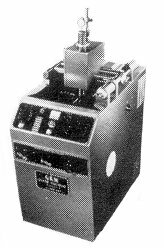 In the late 1960s the Metal Forming Plant Division obtained a computer using the I.B.M. Kraus system. 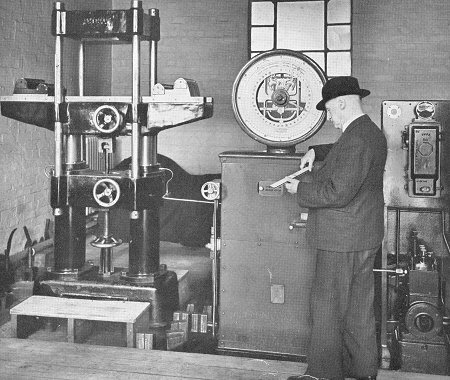 The machine was used for costing orders and to trace the progression of orders through the works. A Model 'C' spark erosion machine. The company's newsletter. Courtesy of Nina McCarthy. Cyril Banton. Courtesy of his daughter, Nina McCarthy. The company's Works Engineer, Cyril Banton retired in April 1970 after serving 41 years with the company. 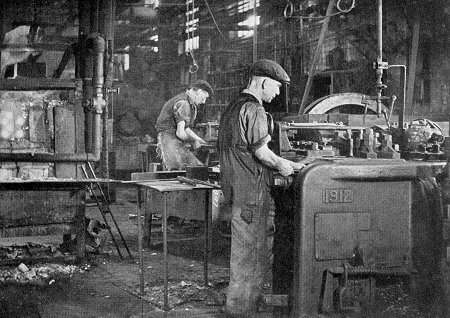 He followed in his father's footsteps, who had worked in the foundry for 40 years. Cyril's son Jimmy also worked there for many years. 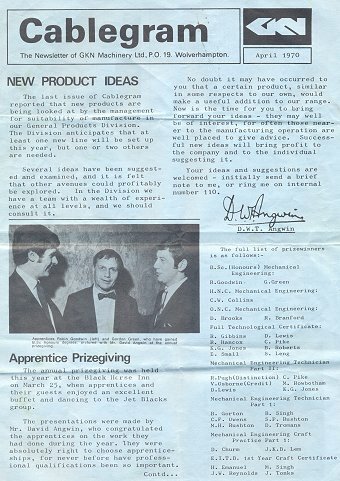 Cyril was originally an electrical engineer until 1963 when his predecessor Bert Denny retired. 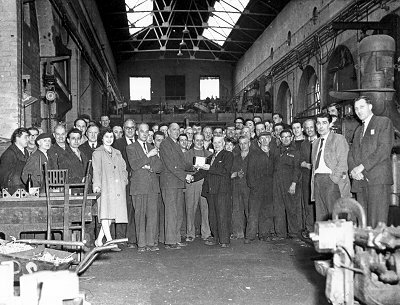 Cyril was involved in several large projects during the modernisation of the works, including the new rolling mill and the machine and assembly shop. 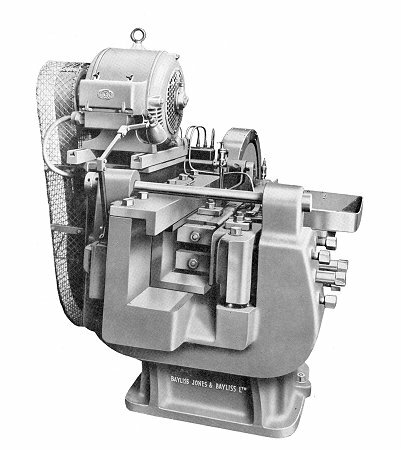 By 1970 the rolling mills were run by James Mills Limited and the Metal Forming Plant Division were producing sophisticated servo-hydraulic control systems. One order, worth £250,000 was for a control system for a large rolling mill for Germany's most prominent producer of tin plate and cold reduced steel strip, Rasselstein A.G. of Neuwied/Rhein. It all came to an end in the 1980s when GKN decided to close the steel side of the business and so the works were sold. An article written by Helen Priddey, which can be found in the Museum Metalware Hall on this website. The History of GKN, volume 2 by Edgar Jones. Material from Nina McCarthy whose father worked for the company. Bayliss, Jones & Bayliss catalogues.